Simon & Schuster, 9781451646078, 448pp. 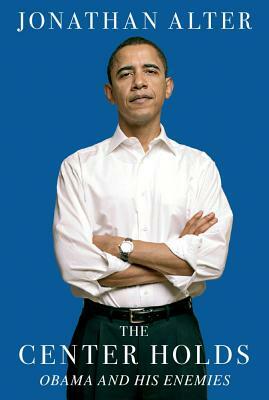 From the bestselling author of The Promise, the thrilling story of one of the most momentous contests in American history, the Battle Royale between Obama and his enemies from the 2010 midterms through the 2013 inauguration. The election of 2012 will be remembered as a hinge of history. With huge victories in the 2010 midterm elections the Republican Party had blocked President Obama at every turn and made plans to wrench the country sharply to the right. 2012 offered the GOP a clear shot at controlling all three branches of government and repealing much of the social contract dating back to the New Deal. Facing free-spending billionaires, Fox News, and a concerted effort in 19 states to tilt the election by suppressing Democratic votes, Obama repelled the assault and navigated the nation back to the center. In The Center Holds, Jonathan Alter produces the first full account of America at the crossroads. With exclusive reporting and rare historical insight, he pierces the bubble of the White House and the presidential campaigns in a landmark election that marked the return of big money and the rise of big data. He tells the epic story of an embattled president fighting back with the first campaign of the Digital Age. The Center Holds will deepen our understanding of the Obama presidency, the stakes of the 2012 election, and the future of the country.